If your furnace fails you and you are trying to decide on repairing your furnace or installing a new unit, the cost to repair it comes close to and sometimes exceeds the cost of a furnace replacement. Most people choose to replace their home’s furnace altogether since the return on investment is greater. The cost of an average natural gas furnace replacement ranges from $2,000 to $3,865. Replacement furnace costs will vary depending on the furnace brand, type of furnace (gas, electric, or oil-burning), energy efficiency, and average furnace installation costs in your area. Get exact costs below. Electric furnace units use electric heating elements to circulate heat through the home. They are compact, easy to install, and usually have an affordable installation cost of $2,675. An oil furnace unit converts oil to heat and is the least common type of furnace. It is usually used in homes where a natural gas line is not readily available. The average cost for an oil furnace installation is around $5780. According to the National Association of Home Builders, the expected life span of a forced-air furnace is between 15 and 20 years. It would not make sense to spend $1800 dollars on an 18-year-old system that might cost $3,000 dollars to replace. You can determine the age of your system by locating the metal identification plate on the inside of the chamber door. Jot down both the model and serial number and give the manufacturer a call. They can help you determine the manufacture date and the average furnace prices of a replacement unit. As a general rule of thumb, if your furnace has used up three quarters of its expected life, do not spend more than a third of the replacement cost to repair it. One final consideration regarding furnace repair or replacement is heating efficiency. The Annual Fuel Utilization Efficiency (AFUE) number is the percentage of fuel your system converts to heat versus being lost through its exhaust or other deficiencies. Older systems, those approaching 20 or more years are probably running at around 70 percent efficiency. According to Energy Star, installing new and more efficient heating and air conditioning equipment can cut your energy costs by about $200 dollars a year for the average home. Savings that can help pay for a new system. Do to their ever-advancing technologies; it is easy to get lost in translation when receiving estimates from heating and air conditioning contractors. Asking HVAC contractors the right questions is key to purchasing the correct furnace for your home and a quality installation. Ask for several bids from local contractors. Never go with the lowest bid, as you are likely to get inferior service and equipment. Ask the contractors what their equipment markup is. A cheaper labor price might include hidden markups in the equipment. Ask your contractor to install a new thermostat. Newer technologies require newer devices to run them. Ask for a detailed estimate or proposal that outlines the entire scope of the job including equipment manufacturers with model numbers and scheduled completion dates. Ask the contractor to go over your estimate including mathematical calculations used to size the furnace. Verify that their calculations are correct to avoid buying an undersized or oversized furnace. Ask for name brand equipment. Cheap knockoffs might fail and leave you out in the cold. Installing a new furnace is a major undertaking. Furnace installations can take anywhere from a few hours to a couple of days depending on the scope of the project. Most homeowners only face this project a few times in their lifetimes. Preparing your home before the technicians arrive is a crucial part of the project that your installers will appreciate. Remove any clutter around or near the furnace areas. A clean area maintains a safer and more efficient work area. Remove valuable and irreplaceable objects from the work area. Although most technicians take extreme care not to cause damage, accidents happen. A new furnace usually includes a new thermostat. Have some touch up paint on hand to cover any imprint leftover from the old equipment. Treat others as you would want to be treated. Happy technicians usually perform better on the job. They will go the extra mile for you if you are courteous, provide them with restroom facilities and offer them a cold drink or two. A furnace falls into the forced air heating family. To understand how a typical furnace works you must first familiarize yourself with its five main components. Since the burner is probably the most essential, it is first up on the list. 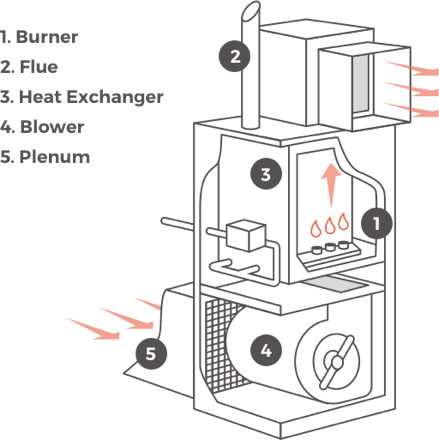 For a detailed overview check out this page: How Does a Furnace Work? The furnace burner is where a mixture of fuel and air is ignited and burned to produce heat. A flame called a pilot light uses an electronic spark that works similarly to that of an automobile spark plug to ignite the burner. The furnace flue diverts hot, hazardous combustion byproducts known as exhaust out of the house. The flue which is manufactured from galvanized metal, connects to the furnace’s combustion chamber and rises up through the ceiling or exterior wall. The heat exchanger is one of the most important parts of a furnace. Their size and shape can vary depending on the type of furnace and the fuel that fires it. For the most part, the heat exchanger is a series or set of tubes and coils that reside inside the flow chamber of your furnace. These tubes or coils heat the air as it passes through them. The blower works in conjunction with the aforementioned furnace components to heat your home. It is the part of the furnace system responsible for circulating the conditioned air throughout the home. The blower is a fan mounted inside the furnace over the heat exchangers and below the plenum and ductwork. The plenum is a box, usually made of galvanized sheet metal that attaches to the furnace outlet. It acts as a central manifold from which the remaining ductwork attaches. Both the plenum and ductwork are responsible for directing the conditioned, heated air throughout your home. Failure to change or clean filters. A clogged filter forces your system to work harder to circulate the heated air. The extra strain can fry fan motors and their limit switches, inviting costly repairs. An overall lack of maintenance. Failure to maintain your system with periodic maintenance and adjustments can lead to major equipment failures and expensive repairs. A faulty or malfunctioning pilot light may prevent your system from igniting at start up. A faulty thermostat can wreak havoc on your system by inducing cycling, which is when your system turns on and off intermittently. A faulty fan limit switch may cause the blower to run continuously, shortening its expected life span and/or frying the motor. A tripped circuit breaker or blown fuse supplying your heating system may be a sign of a more serious problem. Something within the system could be producing a larger load than the breaker can handle. If the pilot light will not stay lit, it could be as simple as a draft in the room. Verify all windows and doors are closed and eliminate any drafts by caulking, installing weather stripping or replacing thresholds. This problem could also indicate a more serious problem with a dirty or faulty thermocouple. 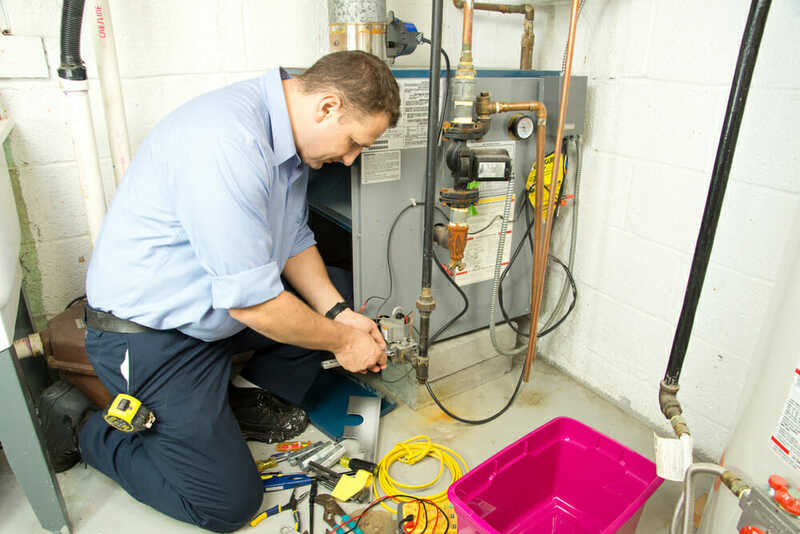 If you suspect a problem with your furnace, do not hesitate to call in the professionals. Delaying the call could be dangerous for you or lead to more costly repairs down the road.